Please share the following information so we may contact you within one business day (if not sooner). Bold items are required. All information remains strictly confidential. Or, just call us toll-free at 877.204.9511. Within our facility in beautiful Plain City Ohio, a few miles from the outerbelt of I-270 circling Columbus OH, we stock our deep inventory, custom laser engrave with our advanced equipment, and package and ship your order. As such, the majority of our products come with a fast 3 day standard production, and we are able to closely monitor the quality of every order, while keeping pricing at low wholesale levels. For all engraved orders you'll receive a fast, free eProof for you to review — even before placing your order, if you wish. We do not charge for general art and design, and also do not charge for design revisions. 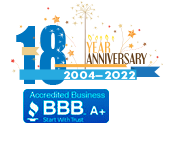 It's part of delivering consistent product and service quality, for over a decade — which has helped earn our top A+ BBB Rating and reviews along with the trust of organizations and businesses across the USA for more than a decade. Our carabiner keychains, dog tags, openers and other products are engraved with true state-of-the-art Fiber lasers. Fiber lasers are the most advanced, and crispest lasers for product engraving as they feature a very fine focal spot resulting in unmatched sharpness, delivering bright, crisp, clean engravings that say premium quality.